One of our conversations this past weekend concerned the value of the Web as a reference source, and how outstanding questions about Tolkien or other interests should be re-investigated from time to time, in case new information has become available online or a library has acquired new material or made its collections better known. Among such queries, we thought first of the early version of Tolkien’s poem Shadow-Bride, said by its author in a manuscript note to have appeared in the ‘Abingdon Chronicle’; but this publication (or one with a different title) is still a mystery. Then we thought of Tolkien’s poems Tinfang Warble and The Grey Bridge of Tavrobel, long known to have been published in what Tolkien noted only as the ‘I U Mag.’ This was later identified by John Garth as ‘presumably’ the Inter-University Magazine: there is no doubt about that, but it is still not known in which issue or issues the poems appeared. As one thing often leads to another, we looked again at our references to Tinfang Warble and The Grey Bridge of Tavrobel in The J.R.R. Tolkien Companion and Guide. In the Reader’s Guide volume (pp. 353, 1007), we wrote in separate entries that those works were published ‘probably in the mid-1920s’, while in the Chronology (p. 120) we dated their publication to ‘?1923–1926’. Also, we were reminded that in Wayne’s Descriptive Bibliography, publication of the poems is dated to ‘the late nineteen-twenties’, and they are said there to have appeared ‘possibly in two different numbers’, whereas in the Companion and Guide we stated that they were ‘not in the same issue’. Furthermore, as different online pages have noted, in The Book of Lost Tales, Part One, p. 108, Christopher Tolkien dates the publication of Tinfang Warble unambiguously to 1927. Clearly, these are differences we need to reconcile in our addenda and corrigenda, and to that end we have searched our files and memories as to the chains of evidence that led to our various statements. It seems likely that the first part of our Chronology date ‘?1923–1926’ stemmed from the fact that Tolkien had revised Tinfang Warble at Leeds in 1920–3 (as he recalled), giving 1923 as the earliest possible year in which a still further revision could have been published. As for ‘1926’ as a terminal date, that seems simply to have been a typo for ‘1927’, which we would have chosen because the Inter-University Magazine ceased publication under that title in the first part of 1927, and was reborn in October of the same year as the University Catholic Review. In drafts of the Chronology, we dated the publication of Tinfang Warble to 1927, because Christopher Tolkien had done so; but we learned from private correspondence with Christopher that he could not recall how he determined that date – he noted that Humphrey Carpenter also had assigned the poem to 1927, presumably in some private reference (we can find nothing in print) – and he could not retrace the line of evidence. We felt, therefore, that a less absolute publication date should be expressed for Tinfang Warble, as well as for The Grey Bridge of Tavrobel, for which there was no evidence of the date of publication other than that its typographic presentation (fonts and layout) is identical to that of Tinfang Warble – and for that reason, we described them in the same Chronology entry. For the most part in that volume, we preferred to begin entries as specifically as possible with days, months, and years, rather than with more vague labels such as ‘?mid-1920s’ (there are a few of these nonetheless, some variation having entered, despite our care, over the years we spent assembling the Chronology); but maybe the latter would have been better in this case. Wayne’s phrasing in the Bibliography (p. 344), ‘published in the late nineteen-twenties’, encompasses both poems, but he was especially cognizant of Christopher’s dating of Tinfang Warble to 1927. (At the head of his preserved bibliographical notes for the poem, though, is the query: ‘How do we know it’s 1927?’) Here the adjective ‘late’ was meant to include the last half of the decade, after Tolkien’s return to Oxford, the ‘I.U. Magazine’ assumed (at a best guess c. 1992) to be published by ‘a Catholic organization at the University’. Our ‘mid-1920s’ in the Reader’s Guide and the list of poetry in the Chronology appendices was meant to indicate mainly years in the middle of the decade, but to reach as late as 1927 – no description being perfect when evidence is lacking. We have in our collection four stray issues of the Inter-University Magazine: vol. 1, no. 1 (undated, but late 1919); vol. 5, no. 3 (Summer Term 1924); vol. 6, no. 2 (January 1925); and vol. 8, no. 1 (November 1926). We were lucky to buy these from a dealer in scholarly journals in spring 2006, but were then under the shadow of a final deadline for the Companion and Guide and not able to give them a thorough analysis. Our main concern (and disappointment) at the time was that none of the four issues includes Tolkien’s poems. We can now determine from these, however, that the publication schedule of the magazine followed the academic year, and at first, three numbers were published per year. With the issue for November 1926, the frequency changed to only two numbers per year. Pagination was consecutive within each volume. The number of pages per issue varied, but averaged around sixty. From these facts, a certain amount of extrapolation is possible. We can verify that Tolkien’s poems were not included in either of the two numbers to appear in the first part of 1925. The January 1925 issue is paginated [ii], 67–120, and the following number therefore would begin its pagination with p. 121: but Tinfang Warble is on p. 63 of its issue, and The Grey Bridge of Tavrobel is on p. 82, as we know from the preserved leaves. Nor are the poems in the issue for November 1926. We can also reasonably suppose that Tinfang Warble, at least, was not published after vol. 8, no. 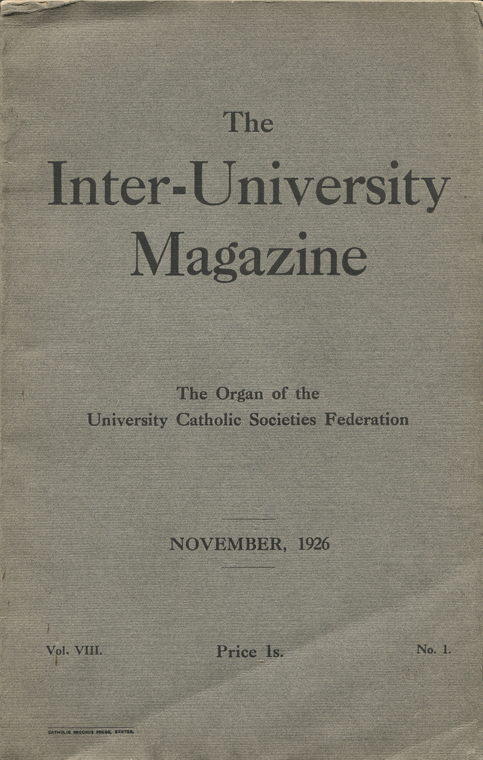 2, in the first part of 1927, due to a reference in the text of the preserved leaf to ‘I.U.M.’, thus the publication was still the Inter-University Magazine and not the University Catholic Review. Supposing that publication of the poems occurred no earlier than autumn 1925, when Tolkien took up his first Oxford professorship – that is, if we accept the implied meaning of ‘Oxford’ opposite the author’s name – and before autumn 1927, when the magazine changed its title, the only issues of the Inter-University Magazine which could include Tinfang Warble would be vol. 7, nos. 1 or 2, at the end of 1925 or the beginning of 1926 (depending on where the pagination broke between the numbers, to include p. 63, but not after no. 2 when the page numbers would be too high), or vol. 8, no. 2, at the beginning of 1927, whose pagination would begin probably with p. 61 (as we know from the extent of vol. 8, no. 1). By the same reasoning, the only issues which could include The Grey Bridge of Tavrobel on p. 82 would be vol. 7, no. 2, at the beginning of 1926, or vol. 8, no. 2, at the beginning of 1927. We’ll include in the next round of our online addenda and corrigenda to our writings a correction to the date given for the two poems in the Chronology, and will amend the relevant entries in the Reader’s Guide to reflect that Tinfang Warble and The Grey Bridge of Tavrobel could, in fact, have been published in the same number of the Inter-University Magazine. Unfortunately, we won’t know for sure one way or the other until it can be physically verified, and so far we have found no institutional or private library with a file of the magazine. The fragility of our copies – the covers particularly are printed on a paper prone to brittleness – suggests that few may have survived. Poetry appears in three of the four issues we own. Four poems by Tolkien’s friend Wilfred (here ‘Wilfrid’) Childe were published in the number for January 1925; Childe was also an active member of the Catholic society branch at Leeds. The Inter-University Magazine in general was closely associated with Father Cyril Martindale, S.J. (1879–1963), long a member of Campion Hall, the Jesuit college of the University of Oxford, a convert to Catholicism, and a leading light (and prolific author) among English Roman Catholics. Image: Upper cover of the Inter-University Magazine for November 1926.